The national average mid-career computer science salary is $110,100, according to Payscale. Computer science is one of the highest-paying fields, with an average starting salary of $65,900. Your computer science salary will depend on several factors, including your position, experience, and education. But in general, salaries for computer science graduates are high across the country due to the widespread demand for qualified IT applicants. Which Computer Science Jobs Have the Highest Salaries? Your computer science salary will depend greatly on your position. See the list below for job titles, average salaries, and projected growth, according to data from the Occupational Information Network. With an Applied Computing bachelor’s degree, you will qualify for each of these positions. Regardless of which college degree salary report you read, computer science is near the top of the list. NACE’s Winter 2017 Salary Survey states that across regions, engineering and computer science graduates are projected to be the highest-paid professionals over the course of their careers. Payscale’s 2016-2017 College Salary Report listed computer science in the top 15 highest-paying bachelor’s degrees. (Nine of the 15 majors were in engineering.) In the report, mid-career income for computer science majors topped $116,800. Want to compare salaries for computer science and other majors? 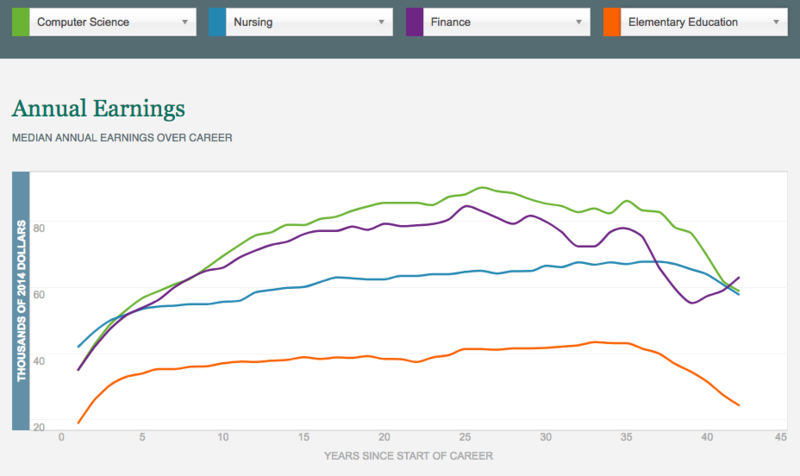 The Hamilton Project created a tool that compares earnings for different majors over the course of a career. Try it here. The average starting salary for computer science graduates is high. In a 2015 survey, computer science majors had the highest average starting salaries ($66,161), followed by engineering ($65,000), math and statistics ($60,300), economics ($58,600), and finance ($58,000). And one third of all computer science graduates had a starting salary over $75,000. The survey also showed that computer science students know the value of their degrees. Over 70 percent of them expected a starting salary over $55,000. Additionally, starting salaries may be on the rise. Payscale’s 2016-2017 salary report shows that the average entry-level computer science income was seventh highest at $70,900. According to salary data from the U.S. Bureau of Labor Statistics, the average national salary for IT professionals with bachelor’s degrees is $30,540 higher than the average salary for those with associate degrees.